I’m playing catch up with life this summer. Mr. Hurricane ruined my perfectly organized schedule this year (I keep telling myself it was organized until Arthur had his way with my life). However, his aftermath did leave behind a few wonderful things. 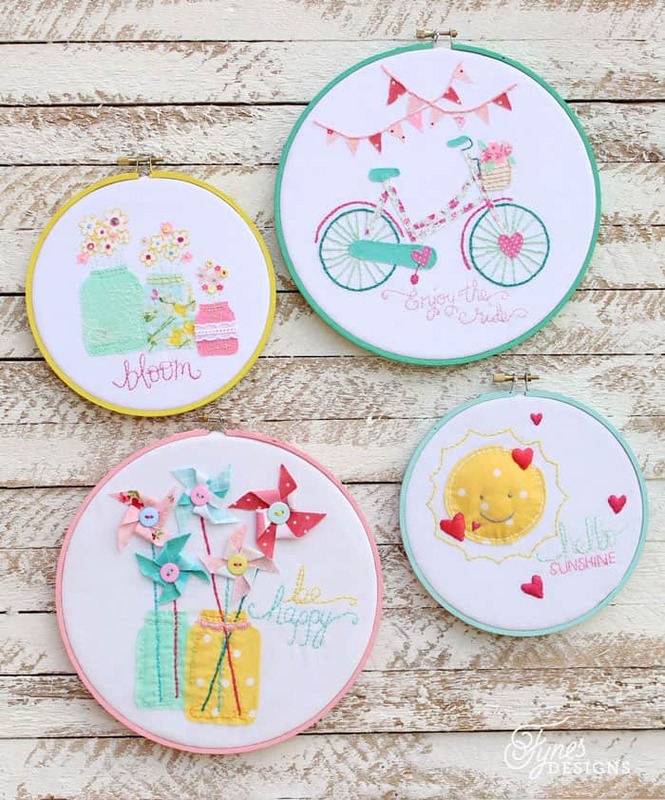 One being my Summer Swimsuit Wreath and when I was finish making that, I moved onto this super cute set of Summer Inspired Hoop Art pieces. Embroidery is the perfect activity when the power is out, not to mention how inexpensive of a craft it is. Darice has a great selection of supplies. I’m always inspired by Bev from Flamingo Toes (check out her entire Embroidery gallery), she makes the cutest Hoop Art pieces so I had to take the opportunity to try my hand at it too. Her Retro Camper is my favourite piece! When I came across this vintage Crewel Embroidery Chart at a thrift shop I knew I could master the process (ok, maybe not master, but I was prepared to put my best foot forward!). The stitches I used for these hoop art pieces were chain stitch, stem stitch and the french knot. I’m no professional, I only used a few of the basic stitches, but I think I’m off to a good start! I used white fabric (it might have even been a bed sheet) backed with white craft felt to give the hoop art pieces some stability. Prior to embroidering the lines and fonts I lightly drew them in with pencil first. However, I think using a water soluble pencil is the best idea, this embroidery site has lots of different methods. I hand cut the pieces from a bicycle I drew, and used my Xyron Teresa Collins Clear Hold Adhesive (which is included in the Teresa Collins adhesive kit) to glue down the frame of the bicycle, the hearts, and the pennants on the banner. That way I could use the vintage floral fabric. For the ‘bloom’ piece I cut the flowers right off the fabric and again glued them on with the Xyron Teresa Collins glue. Then just added a french knot to the centre! The May Arts Ribbon makes the perfect wrap on the mason jars! I really love this hello sunshine piece. Wouldn’t it be perfect for a baby gift?! Seriously, can you look at the grin on that sunshine without smiling? I made the sun a bit 3 dimensional by adding a small amount of stuffing just before I stitched it closed. The hearts get their puffy appearance by stitching in one direction, and then in the other. See the Padded Satin stitch on the diagram above. Does this guy make you happy?, yeah me too! The pinwheels were super fun to make! 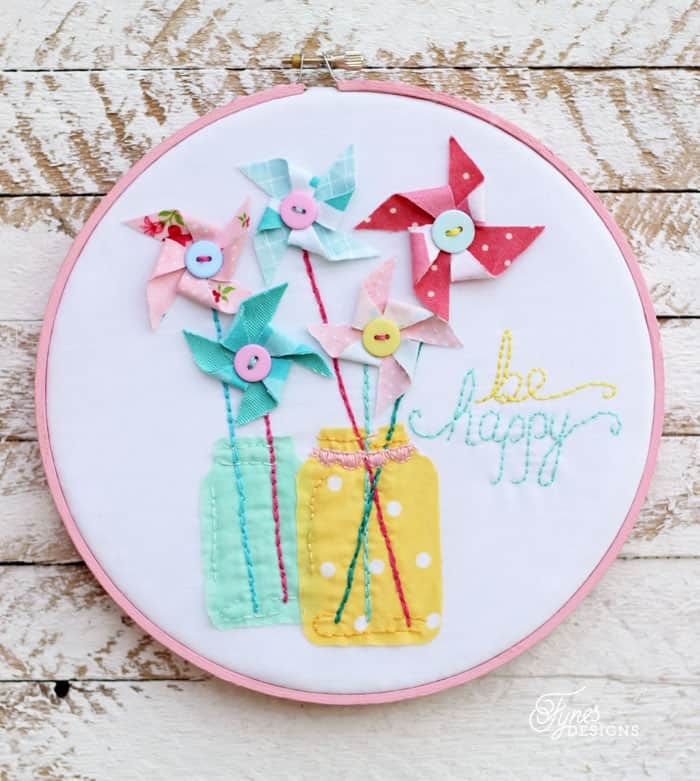 If you’ve never made a pinwheel before check out this pinwheel tutorial from Apartment Therapy. Theirs are made with paper but the same technique applies for these fabric lovelies. 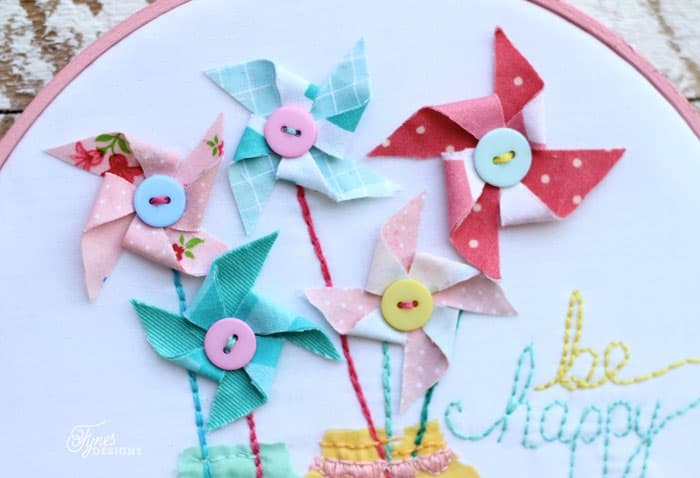 To make the fabric appear to have different patterns I cut two squares the same size and ran one through my Xyron 5″ Creative station , and stuck them wrong sides together before creating the pinwheel. A collection of colourful buttons makes for the perfect centres! I decided I’m in love with embroidery, you’re likely going to see a lot more coming your way! 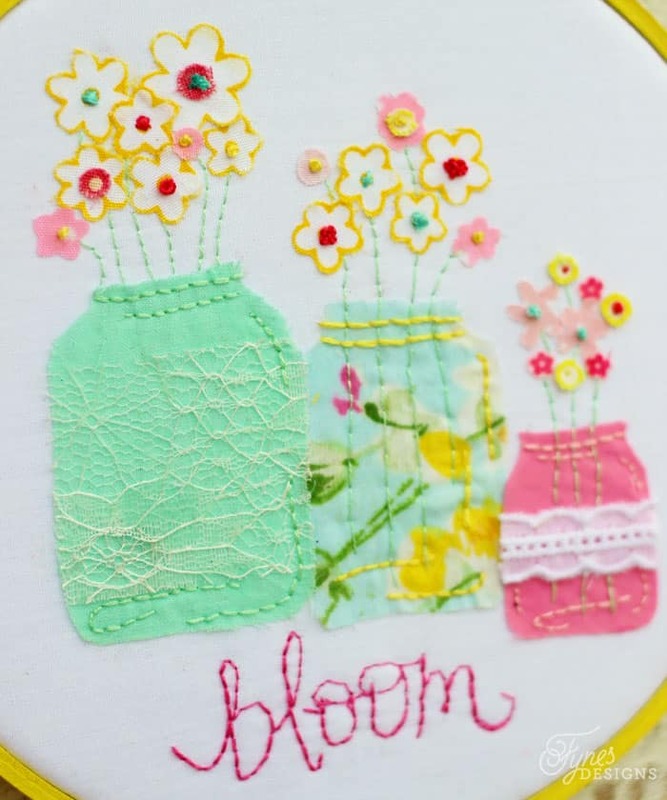 Have you tried embroidery before? I think I need to master the art of wearing a thimble! Really pretty! I heart the pinwheels. Well done! I love embroidery. These are darling. I feel inspired to try some new projects–my little girl’s walls could use a few more decorations. Pinning! Well done! I love embroidery. These are inspiring me to pull out my needle and hoops and get to work. My daughter’s room could use some more decorations. Thanks! Pinned! Thanks Kelly, Get to work! They are so fun to create! So cute Virginia! I love the happy sun. 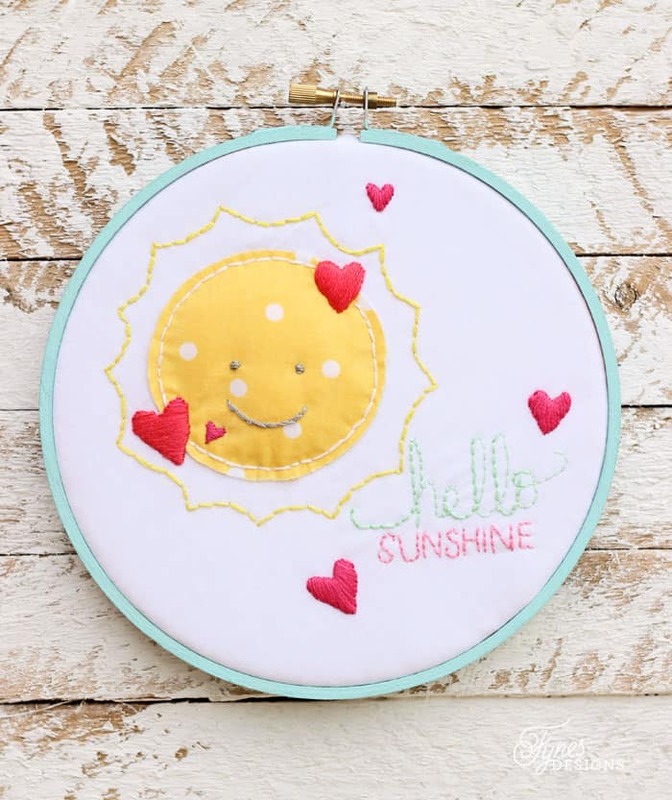 The hello sunshine embroidery hoop is adorable! WOW! These are just adorable! Those all are just adorable! Love the mason jars and definately the bike! 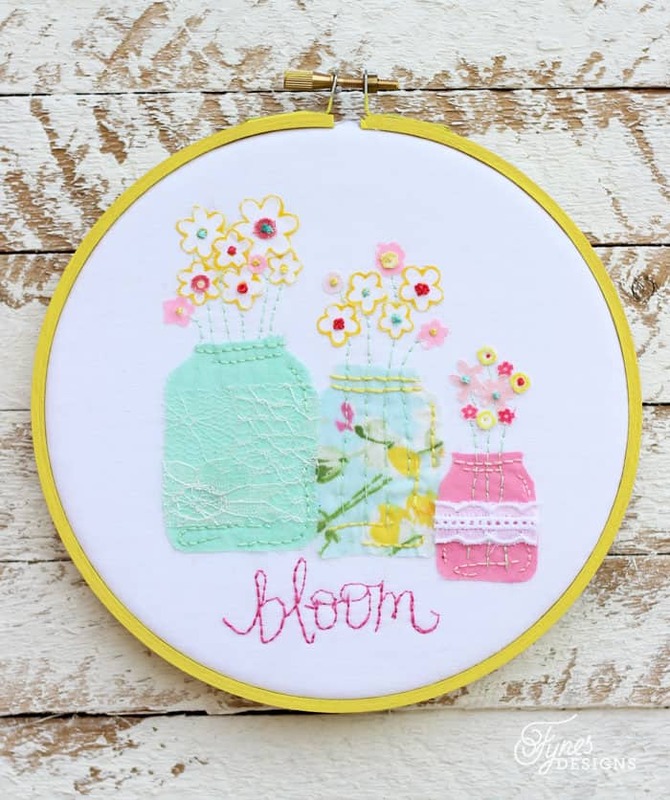 I love embroidery too…..a good way to relax! ABSOLUTELY adorable!! 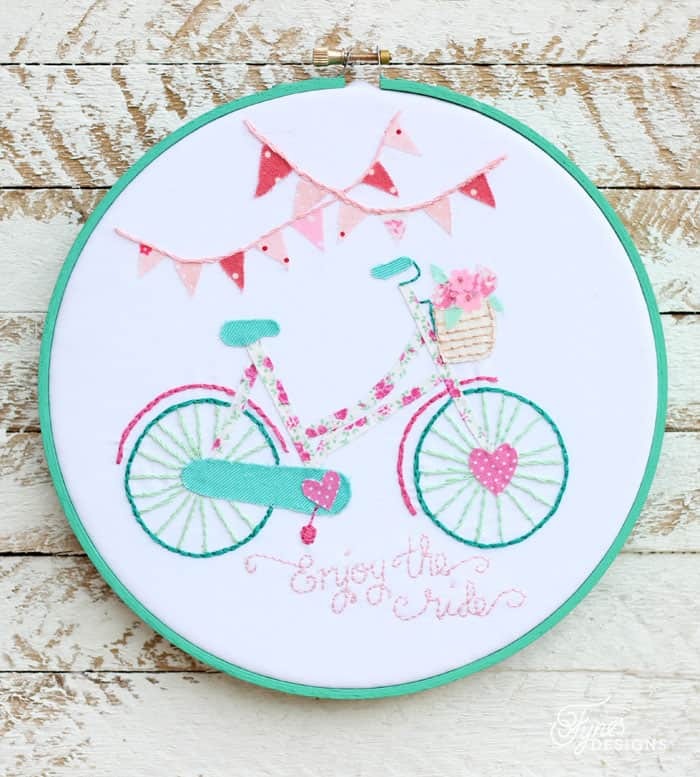 Thanks so much for linking up this fabulous hoop art to the par-tay this week. Have a fabulous weekend. AAAAAhh! These are the cutest things I’ve ever seen. I LOVE the patterns and colours you chose! Thanks Christina, I might have a new addiction… because I needed another! Wow, these are incredible! I love seeing the details in your beautiful photos. Thanks for sharing! Very inspiring! Thanks for sharing on the linky party! Sharing these on my fb page today! Pinned! Seriously, EV-ER-Y-THING you do is swoon-worthy, Virginia. I’d be doing cartwheels across the room if I could even create one of these masterpieces let alone all 4. You’re a rockstar crafter, through and through. Thanks so much for sharing them on my FB page at The Creative Spill! Off to pin…. Thanks so much Lauren, you’re too sweet! I’m sure you could master these, your crafts always ROCK! Uhm, these are amazing. If I could be a wall, I’d want these to hang on me! 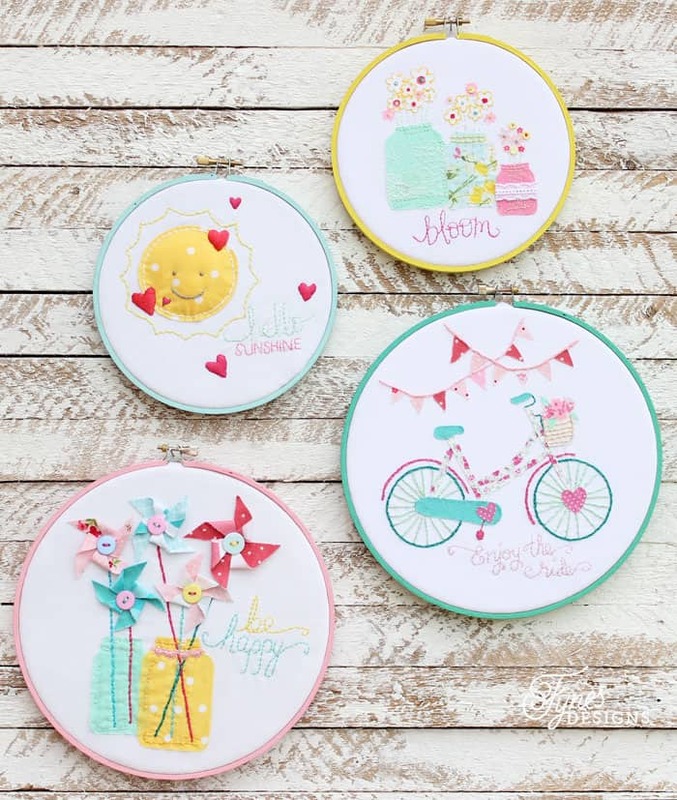 These are so adorable and would go perfectly in my daughter’s room! I hope I can make them as good as yours turned out! I’m sure they will, this craft is so forgiving! I’d love to see them! Beautiful! Any chance these are for sale? I usually don’t sell my crafts, but these don’t have a home yet, so I’d be willing to part with them, PM me! So pretty! My favorite is the bicycle! I’m pinning these to my embroidery hoop board! LOVE these! So pretty. Going to try to make time to make these! Thanks Laura! I hope you give it a try, its such a relaxing craft. you can really let your imagination run wild! Girl! These are beyond amazing! So much detail. Love them. Thanks for stopping by Rebecca! I had a lot of fun making them! I love these! Do you have patterns available to print or download for the jars and/or words? Hi Lisa, I did these designs free hand because the power was out for days, but that is a great idea for next time! Thanks for visiting! I don’t know how to embroider but I LOVE THESE! The colors are gorgeous and they are beyond adorable! Could I get a pattern of these. Sorry Cathy I didn’t make a pattern, but next time I definitely will!